Everything I’m doing is completely opposite of what I would normally do. Generally, on days that I fly, I would drink very little that morning to dehydrate myself. And then, I’d drink very little throughout the day so I wouldn’t get the urge to pee. I’m pushing my fears and pushing my Paruresis boundaries. Today, I’ve been drinking cups of coffee all morning (like I would any other normal day). Today, I’m making sure to drink plenty of liquids because I do plan on stepping foot in the Airport bathroom, and I do plan on peeing in the Airplane. It’s Vegas here I come! We’re heading for a 3 day convention and it sounds like a good ole time. Me and Mike get to the airport 1 1/2 hours before the flight. We decide to sit down and have a bite to eat. It’s 2 P.M. The flight is at 3:30. I order a Sierra Mist and a Turkey Cobb Wrap for lunch. And going against all screaming notions in my head, I drink the entire glass (I’d normally take two small sips and that’s it). And then, what do I do next? I order another glass. Yep, that’s right, I told you I was pushing my limits. By 2:45 I’ve finished 2 full glasses of soda and as we’re heading towards the gate, I stop and grab myself a Medium Turtle Coffee (Snickers bar, Caramel, Milk Chocolate) YUM! We sit at the gate for 15 minutes while I drink. Mike goes to the bathroom, and by the time he gets back, my coffee is finished and I tell him I’m going to go before we board the plane. After all, Airports and Airplanes are two of my biggest phobias. But I told myself that I need to face this. This is why I’m here. I step up to one of the center urinals. There are two rows of them, probably 15 in all. They are back to back and at a quick glance I can see that they are spaced out enough for everyone to have a urinal separate from other guys. Cool Beans! Just the way it should be. And at the start, I was peeing slowly. I tried to just ignore all the commotion around me. I could tell my heart was racing and my anxiety level was raised. But I peed, and then, after about 20 seconds into it I got full stream. That is a Massive Milestone for me! I peed, finished, washed and left. We boarded the plane, took off on time, and within 1/2 hour they’re coming down the isle with snacks and drinks. Normally I would pass “No Thanks!“, but nope, today I bravely order another Sierra Mist (or as the Flight Attendant called it “a Sprite“). Mike looks at me with raised eyebrows. He knows I’m really pushing myself and wants to make sure I know what I’m doing. I drink the cup of soda with my little crunchy cookies and enjoy the smooth sailing. An hour later, Mike says he needs to go to the bathroom. I didn’t have a huge urge to go, but I figure I would try. No use making the little old lady on the isle get up twice. I follow him to the back of the plane ignoring all the stares and glares. The weird thing is, my anxiety level seemed pretty calm. Not what it would normally be. I’m thinking about this whole “Peeing Thing” in a new frame of mind. Mike goes into one vacant bathroom, and I go into the other. I still have my iPhone in my pocket and I’m listening to Eminem on my head phones (“Lose Yourself”). I unzip and hang on to the wall for support (the plane is rocking back and forth slightly). For I was already Peeing! It started slowly, but within seconds I was peeing really fast and full. I’m Peeing on the Plane! I look at myself in the mirror rather shocked. I smile really big. I can’t believe it. It’s been many, many years since I’ve been able to pee on an Airplane (I fly plenty of times a year). And the last couple of trips were complete nightmares! (read here: No Pee on Plane!). That trip was a living hell! Today I was peeing and peeing and peeing and I peed until my bladder was entirely empty. That blows my mind. I’m quite flabbergasted. I finish and leave. I get back to my seat and sit down. I sit there for another ten minutes without saying a word (Mike is watching a movie). 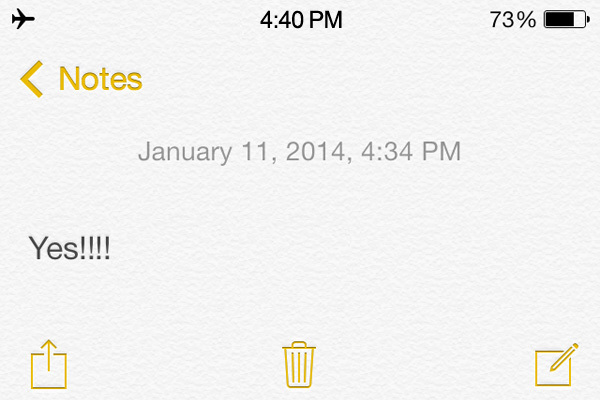 I pull out my iPhone and type one word into my notes for Mike to see. His face lit up. He gave me a big smile and a big thumbs up. And when he did that, my eyes teared up. It was crazy, I couldn’t stop it. Being able to pee on a plane has got to be one of my biggest victories yet. I peed in the Airport and on the Plane. I was overjoyed. I couldn’t even contain myself. I just teared up. My emotions and happiness washed over me. It was like a dream come true. I tried to contain myself and not break down. I can’t even tell you when I cried last. I never cry. But this was uncontrollable and exhilarating. It was beyond all comprehension. I rested in my seat for the next hour or so. I couldn’t stop thinking about it. I had my hoodie on and at one time I had to pull it down to cover my eyes because they were tearing up again (and they are now as I write this). I did it! I really did it. I was literally on cloud 9. 2 hours later, they came around again “Of course I’d love some Coffee!” I tell them. :) And I drank it all up. I get to the bathrooms, there’s no line. I head in and shut the door. I stand there at the toilet for a minute and wait. I really did debate actually using the bathroom again or not. Because the last thing I wanted after 2 awesome successes was a trip that didn’t end so well. I did not want a failure to ruin the whole day. And I stood there and waited for a couple more seconds. Will I pee or not? At one point I even glanced over my shoulder to see if there was a crack in the door… I saw none. More seconds go by. I decide to egg it on with Breath Hold again. So I hold my breath and wait! Usually I would have to hold my breath past the gasping point, about 40 seconds in, before I would pee. But not today, 15 seconds into Breath Hold, I started to pee. I’m Richard! I’m a new man! I peed all the way, and then went back to my seat. And for the first time in a long, long time, I actually enjoyed the rest of the flight. I wasn’t in pain. I wasn’t uncomfortable. It was the most refreshing and relaxing plane trip that I’ve ever had (all 4 hours of it). That wasn’t happening today. I felt fine. I had an empty bladder. I had no urgency whatsoever. No emergency. I felt alive and very, very different than any other flight I could remember. I could have stayed out for hours! Words cannot express how I felt. It’s something that I’ve never experienced before. I didn’t believe it was possible. And then later that night, after we checked in and registered for the convention, we decided to grab a burger. I am no longer letting Paruresis dictate my life. I am not going to let my Shy Bladder handicap me and tell me where to go, when to go, and how to go. It’s not going to change or alter my plans anymore. I’ve over it! We ate burgers and fries and they were good. I drank plenty of Root Beer and I loved it! I’ve had a lot of liquids today, and I’ve had plenty of success as well. It’s been a tremendous journey and I’m dumbfounded that I did so well. My progress to this point is insane and life changing. Just 3 months ago I couldn’t pee in a locked bathroom with Mike even close to the door. Now, I can pee at urinals in public bathrooms, with other guys around, in Airports, on Airplanes… and it really does make me speechless! I’m doing it. I’m living my dream. Sure I cried on the plane, but that was a mountain I just climbed. One of the tallest mountains in the world. I grabbed my Root Beer. “A Toast to Pee?” I laugh. I didn’t hold it in. I didn’t dehydrate myself. I didn’t wait so long to go that the urge to pee disintegrated and locked up. And mentally, I was fully prepared (just as with Fluid Loading), that I WOULD pee in public! I had no choice. I’m changing my thoughts and actions. Which is changing my feelings and behaviors. What will tomorrow bring? I don’t know! More success? More Failure? It doesn’t matter. Because it’s working, little by little, small steps to cross huge miles. I’ll get there with a smile on my face. Awesome success story Richard! You give me hope! I have difficulty peeing on airplanes too, well not just airplanes… The airplane thing is a serious issue for me in particular though considering I am a full time corporate pilot. I am likely going to be assigned to an ultra long range airplane soon so I need to get this thing handled. I am determined to do it and your story gives me encouragement. Thanks! Thanks man. The airplane I currently fly has one bathroom in the very back of the plane. It’s close to the size of a bathroom on average airline bathroom. I have peed in it once with passengers on board and failed once with passengers on board. My urgency wasn’t super high in either case. The time I succeeded, there were only two passengers on board and they were sitting way up front. The time I failed, the plane was full and there was a guy sitting right outside the door. Both times my urgency was not that high. I am very careful not to let my urgency level get real high when I fly but that wont be an option of the long range plane. The long range airplane I’ll likely be flying soon will have two bathrooms. One in the front for the crew and one in the back for the passengers. Probably wont be any easier though because it’s still tight quarters and they’ll often be a flight attendant and/or mechanic lingering in that area. Regardless I appreciate what your doing for yourself and for others like us. I think it will help me. I posted something about this on ipatalk.org and at first the only response I got was “you’d better learn catheter.. and seek CBT therapy..” I really don’t want to cath. I’m going to take your advice and try to improve my condition enough so I can go on a fricking airplane. My username is Annoyed because that’s what I am with this condition. I think it’s one of the most ridiculous anxiety disorders a person can have. It’s just silly! Oh, and very annoying! Thanks again for your help and encouragement.